A good crowd turned out on Sunday evening at the UBC Recital Hall to hear the Sequentia Ensemble for Mediæval Music in a programme entitled "Early Mediæval Prophecies & Laments." 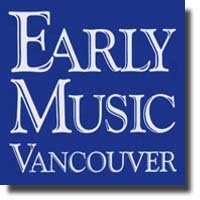 Early Music Vancouver presented this concert, the first in their Summer Festival Series, which continues this week at UBC. As noted in the programme notes, images of the End of Days and the Last Judgement, based largely on the Revelations of St John, were widespread in texts and the visual arts during the Middle Ages. The concert explored some of these texts, and the music they inspired. On the whole, the texts are not happy ones. Indeed, some were terrifying, and give an idea of the extent to which the medieval world was preoccupied with thoughts of the hereafter. The concert began with Eric Mentzel’s sober rendition of "Fortis atque amara," a Frankish sequence from the 9th century. The text is a prayer that depicts the momentousness of the "bitter" Judgement Day, and the anxiety with which it must have been awaited: “And what shall human beings feel, or earth’s creatures, if the hosts of the heavens shall begin to tremble so?” This piece was accompanied by two harps, whose music, from their very first notes, put me immediately in mind of traditional Chinese music. If fear was the dominant emotion in “Fortis”, the next piece in the program, the early-9th century Muspilli-Fragment, showed that the seriousness of the subject matter does not preclude theatricality, even humour. This long text, in Old High German, is an anonymous meditation on the Last Judgement. It wasn’t so much sung as performed by Benjamin Bagby, who gave one the impression that he was telling the story, and very much enjoying doing so. His face and hands were full of expression, and he made interesting use of his voice, modulating back and forth between speech and song. Bagby was so engaging to watch and listen to that I found myself wishing for projected surtitles, so I could follow his story exactly. Medieval music could be said to have a more limited expressive palette than later genres. Yet strophic text settings, harmonic simplicity and rhythmic repetition came together at times this evening to create an atmosphere of timelessness that suited the subject matter very well. Nothing on the programme created this sense of timelessness more than flautist Norbert Rodenkirchen’s hypnotic reverie "Gaude celestis sponsa." This was actually an improvised performance on early medieval sequence melodies. Rodenkirchen performed another solo later which he played a tiny flute made of a swan’s bone. The remains of such an instrument, dating from the 10th century, were found in Germany. A swan-bone flute was not the only exotic instrument on hand this evening. In "Iudicii signum," Mentzel played a symphonia. This instrument doesn’t have the scope its impressive name suggests to modern ears: it’s a wooden box, with a handle at one end that the player turns to create a drone of two notes a 5th apart. Perhaps it’s capable of more than this, but that’s all we heard it do. It sounded rather like distant bagpipes. "Iudicci" was perhaps the emotional low point of the evening, a doleful meditation on the End of Days. It was followed by the much more cheerful "Scalam ad caelos," a harp duet. This was a sophisticated, syncopated dance-like piece brimming with rhythmic life and energy. "Dolorum solatium" (the biblical lament of David on the deaths of Saul and Jonathan) was written ca. 1130 by the philosopher and poet Peter Abelard, possibly for his beloved Heloise. Here we heard the singing of Eric Mentzel again. Mentzel has in general a more restrained presentation than Benjamin Bagby, and made more obvious use of printed scores throughout the concert, but in this piece he was excellent, singing the final words, “my spirit fails,” in an almost inaudible, and very poignant, pianissimo. This fine concert ended on a note of cheer with "Magnus Cesar Otto," a song of praise to three German emperors, featuring once again Benjamin Bagby’s wonderfully sung storytelling.